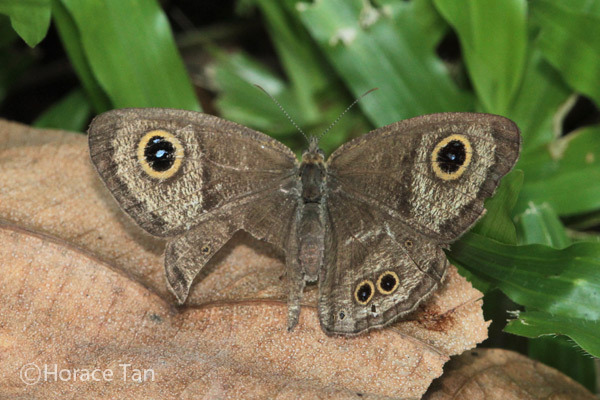 A Commander with its right hindwing damaged : Predatory strike or wear and tear? 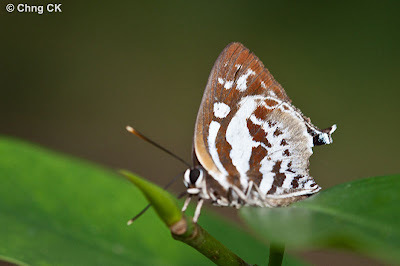 If you're also wondering what happened to spectacular photos of pristine and beautiful butterflies that this blog has become known for, this week's article is about strikes - predatory strikes and 'scars' of attacks on butterflies. In nature, butterflies are subject to dangers of all shapes and sizes in the form of predators whose sole objective is to eat the poor butterflies. 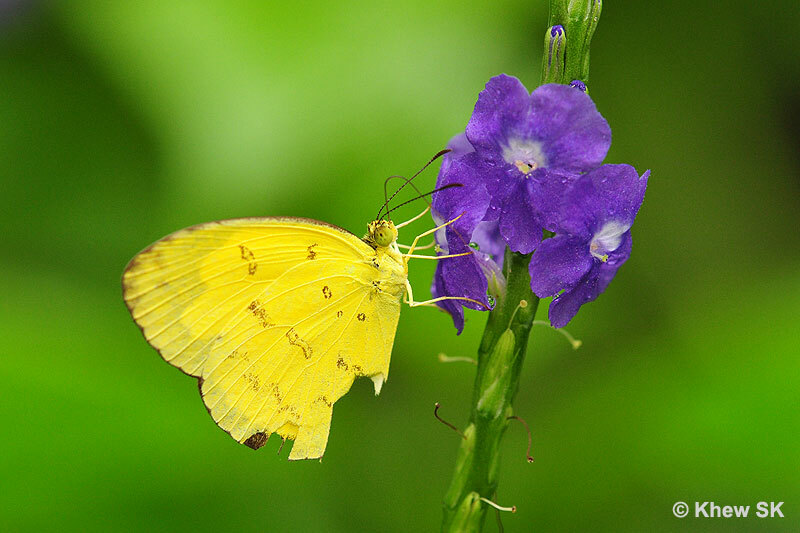 In my earlier articles about predators (see : Death in the Wind), we featured a whole range of predators that feed on butterflies. 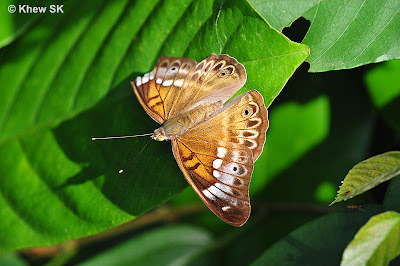 This invariably allows the victim of a predatory attack to escape alive, albeit without a portion of its wings intact. 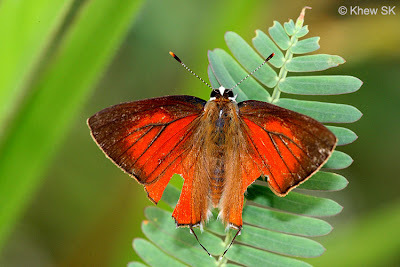 The surviving butterfly will be "crippled" but buys a few more hours or perhaps days of continued survival to either mate or lay eggs, and allowing it to fulfil its ecological function of procreation of the species. 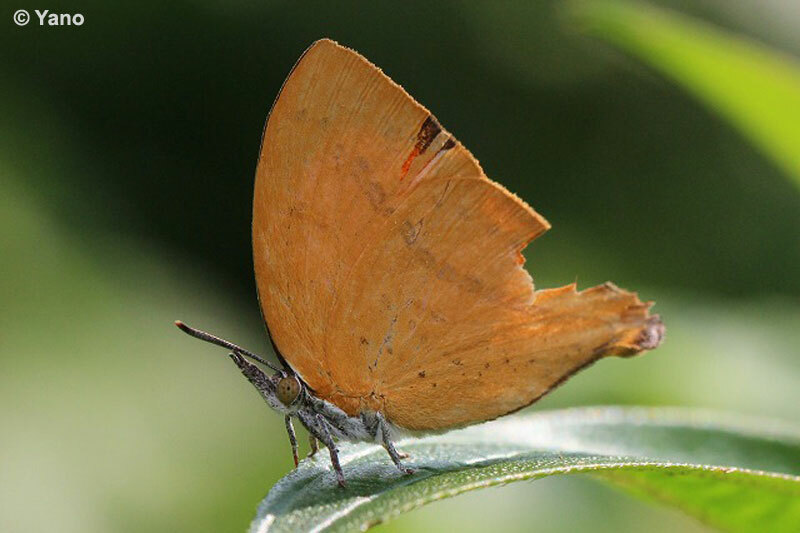 Field observations by ButterflyCircle members have contributed valuable information and photographic records of predatory attacks on butterflies. 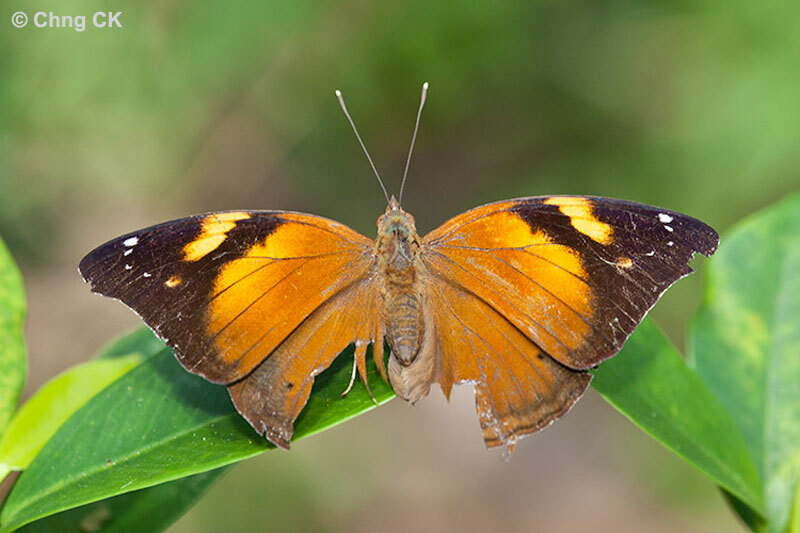 Whilst there are no conclusive evidence of the type of predator that attacked these butterflies, the damage on the wings could give some forensic clues to the types of strikes that the butterflies had encountered. For those butterflies with a symmetrical tear on both wings, a likely predator would be birds, that had tried to take a bite at the victims, but obviously missed delivering a fatal strike. 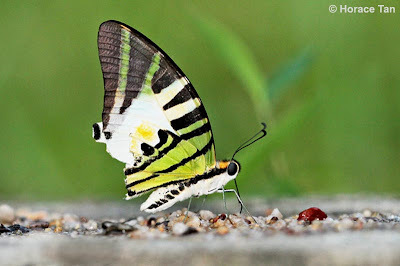 The escaped butterfly continues to go about its daily business, but without a part of its wings. 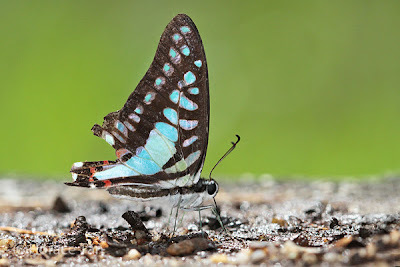 It is quite amazing to consider how much wing material is removed, before the butterfly it totally crippled and unable to fly. 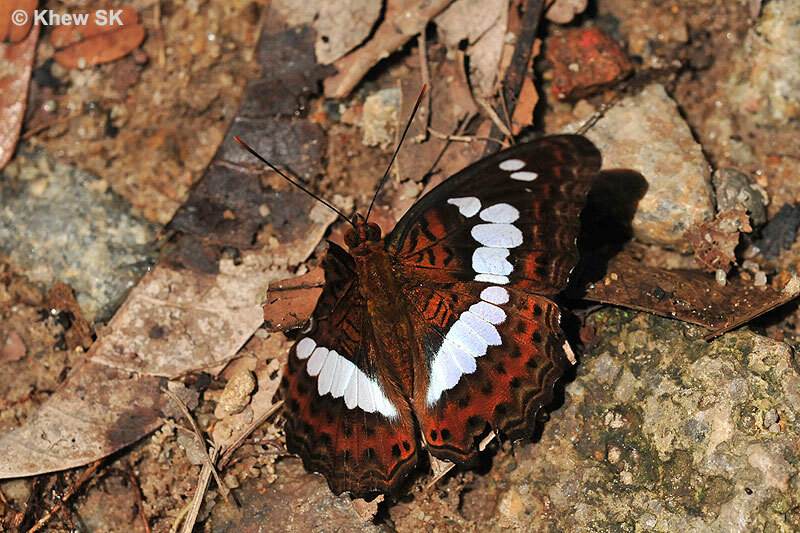 Despite the damage, many of these predator-struck butterflies appear to be still able to fly relatively 'normally'. 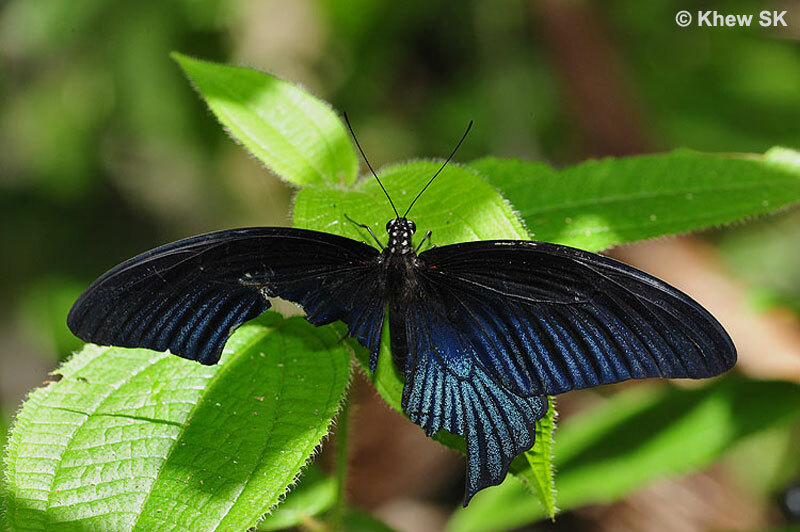 However in some cases, the ability to shift into high gear and take off at their usual speeds is drastically reduced, suggesting that a 2nd attack by a predator would most likely be fatal. 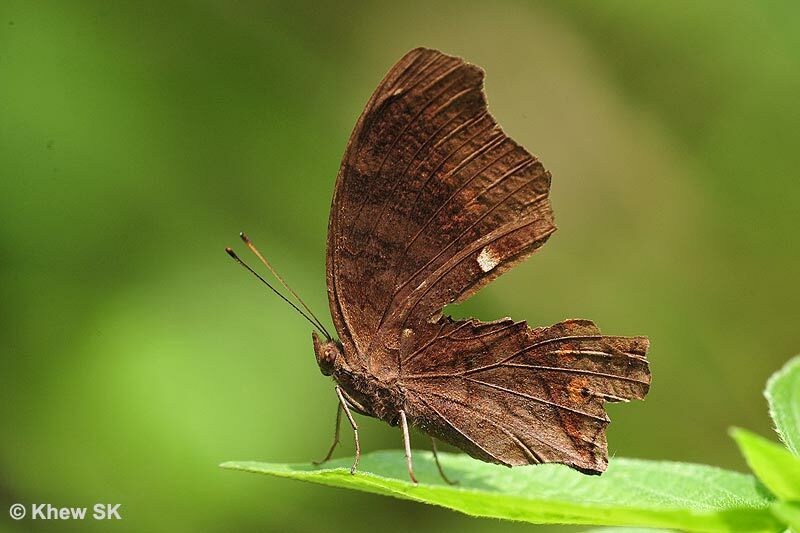 Furthermore, the erratic flight of the damaged butterfly would also call attention to itself and the weakened flight would almost certainly attract nearby predators to attack a "sitting duck". 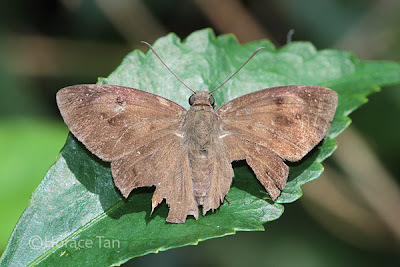 In cases where the wing damage is asymmetrical, e.g. 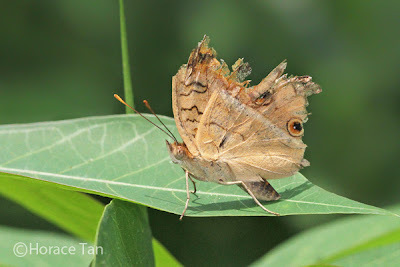 only one side of the wings are torn, it could suggest that the butterfly was sunbathing with its wings opened flat, and the predator managed to take a chunk off one wing as it struck but missed. However, it will be almost impossible to conclude if the predator was a bird, a lizard, a shrew or any other attacker with mouth parts large enough to take a piece off the butterfly's wing. The typical behaviour of the butterfly species is also quite consistent with the types of damage on the wings. For example, a ground lurker like the Ypthima species are more likely to be attacked by a reptile whilst it is sunbathing on a low bush. 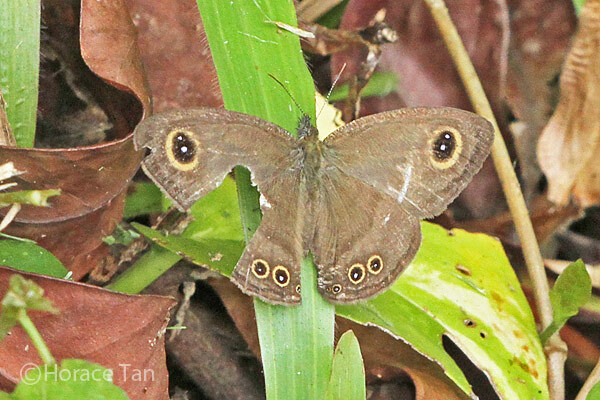 Some field examples tend to show asymmetrical bite marks on one side of the wings only. For a Dark Blue Jungle Glory, that spends most of its day foraging amongst litter on the forest floor, its most likely attacker would be a snake, lizard or a small mammal? Even the "turbo-charged" butterfly species, that are usually skittish and fly at tremendous speeds, are not spared predatory attacks. 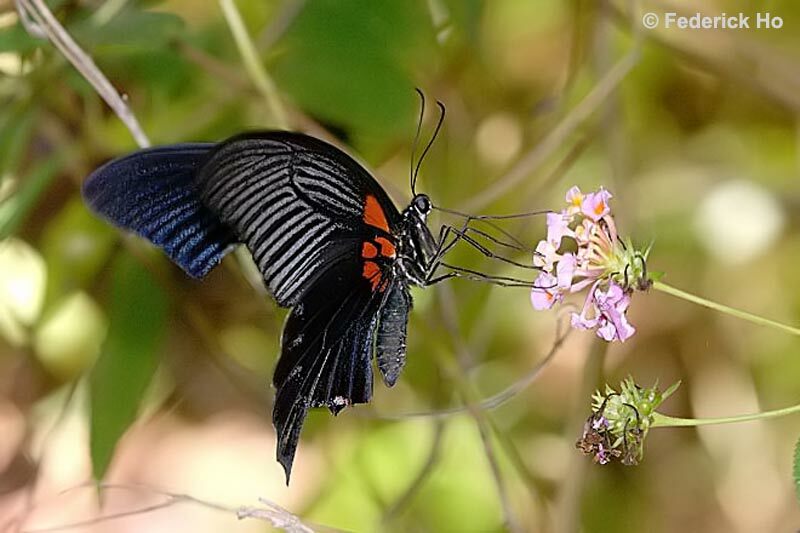 Despite their propensity for high-speed flights and alertness, no butterfly can continue to do so all the time. 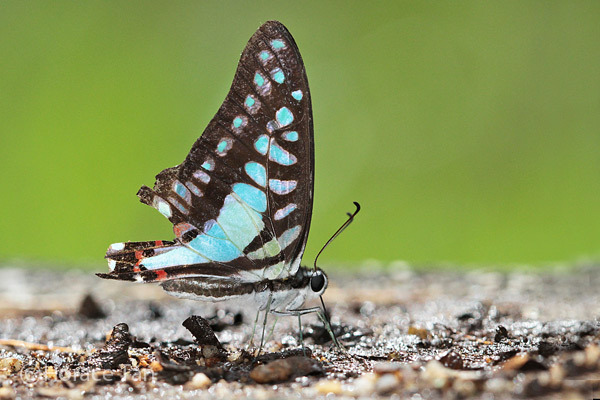 When they come down from lofty perches to rest or feed, that is when a lurking predator has an opportune time to launch a strike at the butterfly. 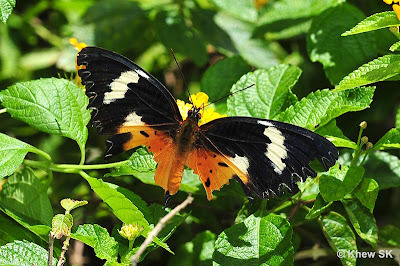 Examples shown here, are two fast flying Paplionidae species, where under normal circumstances are very alert and skittish, and rarely give any chances for predators to chase and attack them when in full flight. However, it is likely that their torn hindwings are examples of predatory strikes that occur when they were at rest or puddling. 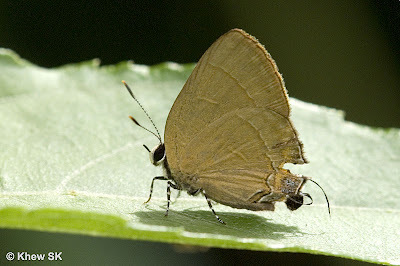 The Lycaenidae, which employ decoy tactics whereby a predator is fooled into attacking a less vital part of its wings, often show evidence that this survival strategy does work quite successfuly in the field. We have come across quite a number of individuals that display scars of such attacks, where the hindwings are torn in a symmetrical manner, suggesting that the predator had been fooled into attacking the "wrong" side of the butterfly where its false eyes and antennae are located. 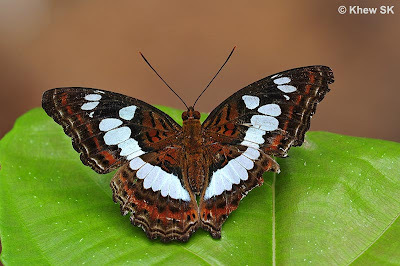 Can this poor Peacock Pansy actually still fly? 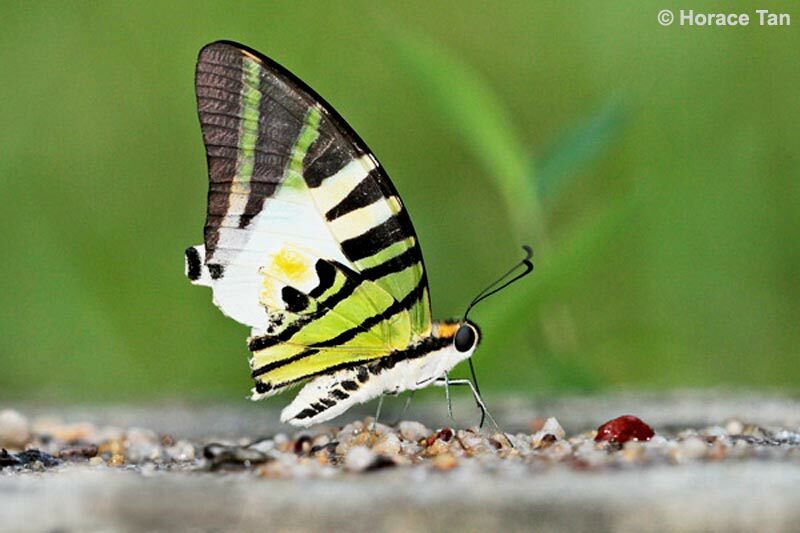 Yet other species, which feature eyespots and rings on their hindwings, appear to also show signs of attacks on the parts of their wings where the false eyes are located. 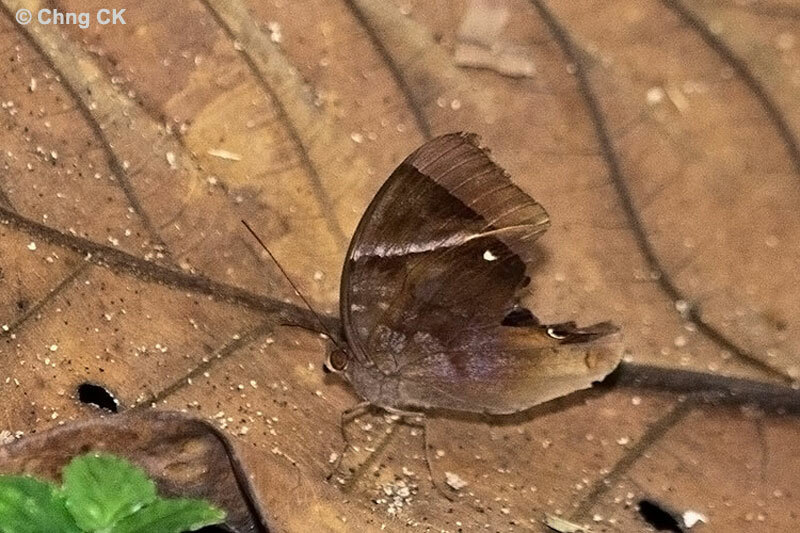 Again, in the shown example of the Chocolate Pansy below, a large part of the hindwings has been bitten off, yet it continued to fly and glide quite normally... until the next (and probably fatal) strike occurs. 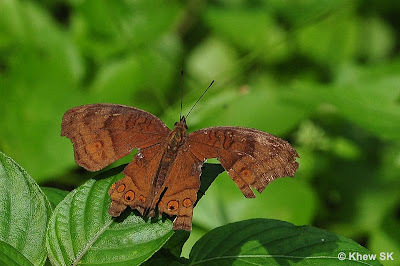 And so we see a part of the daily survival of a butterfly, whose life is always fraught with dangers of being a lucky predator's lunch (or not), and how it manages to escape with its life to "fight" for another day. Whilst the exact nature and the actual predator cannot be easily concluded from these pictures, they show some evidence where the clues help to piece together some possible theories as to what attacked these butterflies. Even this fast-flying Common Snow Flat shows damaged hindwings. 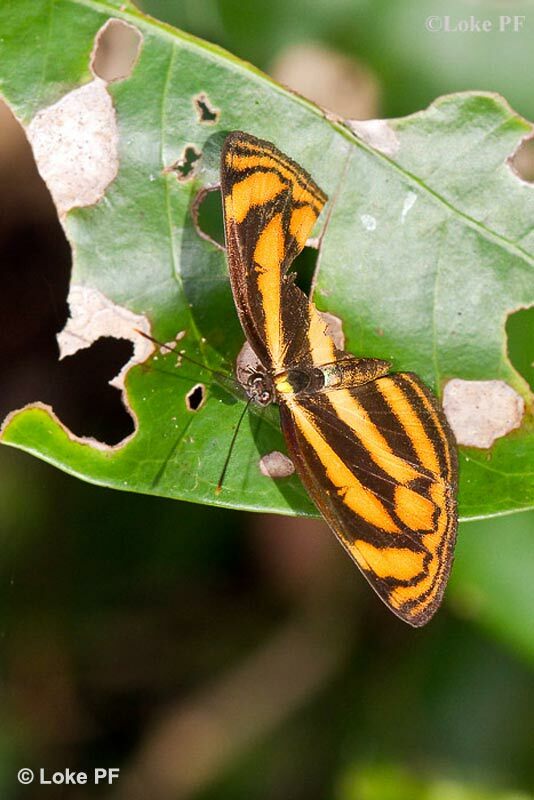 Evidence of predatory strike? Or just damage caused by old age?